Washington, DC. Yeiichi “Kelly” Kuwayama, Combat Medic, 442nd Regimental Combat Team, passed away at noon on June 29, 2014. He was 96. Kelly Kuwayama was born in 1918 in Manhattan, New York City. Though a graduate of Princeton University, he was not able to find employment because of his ethnicity, and entered the US Army in 1941, about one year before Pearl Harbor was attacked. Initially, he was assigned to a Coast Artillery National Guard unit protecting New York Harbor. Because the loyalty of all Japanese Americans was questioned during those times, he was soon transferred from a line unit to a medical unit at Fort Ethan Allen in Vermont. A surprised Kuwayama found he had been reclassified as a “surgical technician” without any formal medical training. Kuwayama volunteered for the 442nd Regimental Combat Team when it was activated in 1943, and was assigned to its Medical Unit. After training in Camp Shelby, Mississippi, the 442nd was sent to Naples, Italy, arriving in May, 1944. Kuwayama quickly earned the reputation throughout the regiment of treating his wounded comrades under fierce enemy fire with total disregard of his own life. He served In one the most ferocious battles of World War II, the 442nd’s rescue of the 1st Battalion, 141st Infantry Regiment of the 36th Division (often referred to as “The Lost Battalion”) in the Vosges Mountains of France. The 442nd broke through the enemy entrapment in five days to save 211 survivors. Kelly himself was wounded during the grueling battle near Biffontaine, France, on Oct. 29, 1944 and was hospitalized at Plombieres-les-Bains hospital, and after a few weeks rejoined the 442nd at the Maritime Alps. 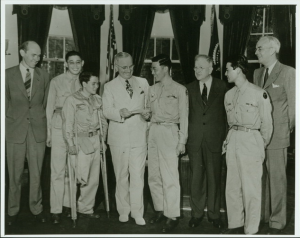 Senator Daniel Inouye, also of Company E, credited Kuwayama for saving his life when he lost his right arm in the Italian Po Valley campaign in April, 1945. 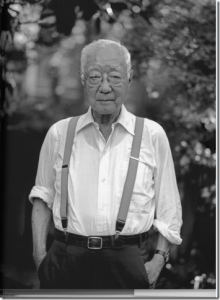 Under enemy fire, Kuwayama was the first medic to reach a severely wounded Second Lieutenant Inouye, stopped the bleeding of his nearly severed arm, and saw that his platoon leader was evacuated from the battlefield. Besides uncommon courage, Kuwayama displayed leadership uncommon for a medic. When German snipers targeted the unarmed Nisei medics with their Red Cross insignia conspicuously painted on their helmets, the infantrymen in Company E, in their state of anger, decided to retaliate against enemy medics as well. However, Kuwayama stepped forward and told the men that shooting unarmed medics, even if they are the enemy, with the Red Cross insignia displayed was a violation of the Geneva Convention and that “two wrongs don’t make a right.” Kuwayama’s words had a tone of authority beyond his rank and the soldiers complied. By the end of the war, Kuwayama had been awarded the Silver Star for gallantry at Biffontaine, Bronze Star Medal, Purple Heart, Legion of Merit, Combat Medical Badge, Italian Croce di Valore and the French Legion of Honor. In November 2011, for heroic service with the 442nd Regimental Combat Team, he was a recipient of the Congressional Gold Medal, the highest civilian honor our nation can bestow. After being discharged in 1945 at the war’s end, Kuwayama completed a MBA from Harvard Business School on the GI Bill in 1947 and continued with a successful career as the US General Manager for Nomura Securities, as well as with the Office of Foreign Direct Investment of the US Department of Commerce, the US Securities and Exchange Commission, and the Civil Liberties Public Education fund mandated by the US Congress. Kuwayama is survived by his wife, Fumiko, his sister Tomi and brother George. A sister, Aya, predeceased him in 2011.